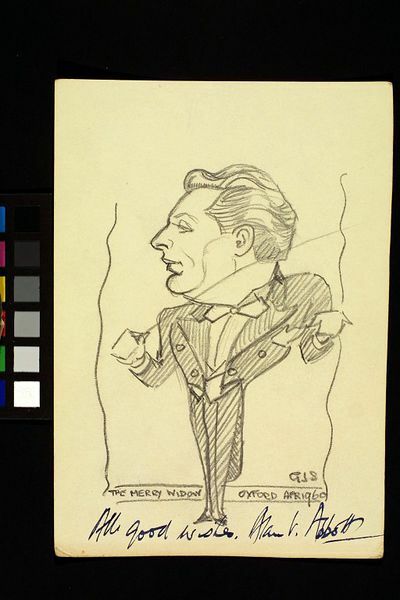 This caricature shows Alan Abbott conducting a performance of The Merry Widow at the Oxford New Theatre in April 1960. It was drawn by Gilbert Sommerlad (1904-1976), a rehearsal pianist and orchestral violinist at the Brighton Theatre Royal from 1932 until 1936, and at the Oxford New Theatre from 1936 for over forty years. Sommerlad sketched the stars on stage when he wasn't needed in the orchestra pit, compiling the sketches in a series of albums. Franz Lehar's musical The Merry Widow was originally produced at Daly's Theatre in 1907 when it ran for over 700 performances. It had several West End revivals in the first half of the 20th century, including a long-running production at His Majesty's Theatre in 1943, and another at London's Coliseum Theatre in July 1958. Alan Abbott appears to have shared the conducting with Charles Floyd, whom Sommerlad also sketched in April 1960. Pencil caricature of Alan Abbott conducting a performance of The Merry Widow, dated April 1960, part of an artist's hard-backed sketch book manufactured by George Rowney & Co., called 'The Euston Sketch Book'. The pencilled sketch is drawn directly onto the page (cream cartridge paper). Titled and dated by the artist and signed by the subject. The artist of these caricatures, Gilbert Sommerlad, was by profession a musician who was born into a family that had a long tradition of professional musicians. In 1936 he moved to the recently built New Theatre, Oxford, to join his brother Roy (violin and clarinet) as resident pianist. Gilbert was an exceptionally good and popular rehearsal pianist, and visiting companies and individual performers used to make sure that he would be available. He became well-known in the profession and his ability as a caricaturist became common knowledge. 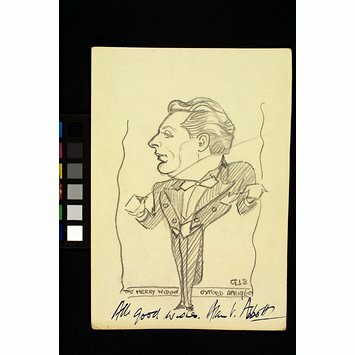 The volume that includes this drawing contains sketches mostly of musical directors and conductors working at the Oxford New Theatre with Gilbert Sommerlad.